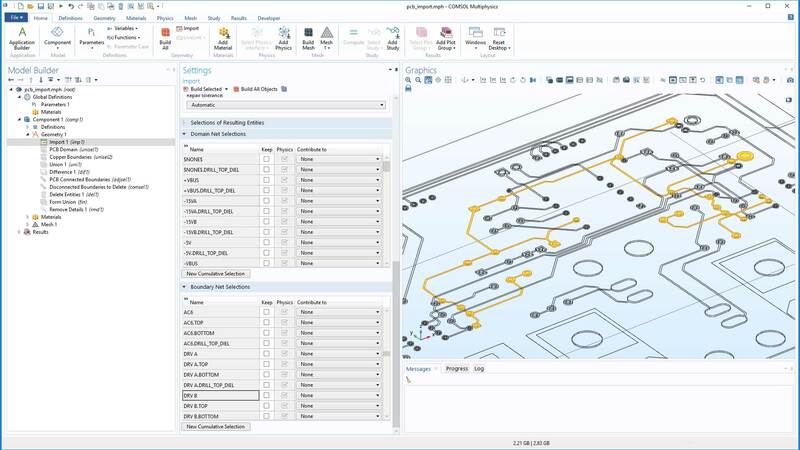 For users of the ECAD Import Module, COMSOL Multiphysics® version 5.4 includes net selections for ODB++ and IPC-2581 files and new buttons for faster file import. Read more about these ECAD Import Module updates below. For PCB files on the IPC-2581 and ODB++ formats, the import functionality now generates domain and boundary selections based on the electrical nets defined in the imported file. The generated selections can be made available as input selections for the simulation setup, for example for physics and mesh definitions, as well as geometry operations. The net selections generated during import of this ODB++ file appear in the two tables shown. Clicking a selection highlights the traces and vias in the Graphics window. The ODB++ file is provided through the courtesy of Hypertherm, Inc., Hanover, NH, USA. The buttons Select All Metal And Dielectric Layers for Import and Clear All Imports have been added to the Layers to import table to enable a more efficient workflow when importing ECAD files. Support for implementation of the ODB++ Format was provided by Mentor Graphics Corporation pursuant to the ODB++ Solutions Development Partnership General Terms and Conditions http://www.odb-sa.com/. ODB++ is a registered trademark of Mentor Graphics Corporation.